Tennessee Titans tight end MyCole Pruitt, No. 85, flips the ball over his shoulder after scoring the winning touchdown against the Washington Redskins on Saturday. The Titans have lost two tight ends to injury this season, leaving Pruitt and Luke Stocker to carry the load. 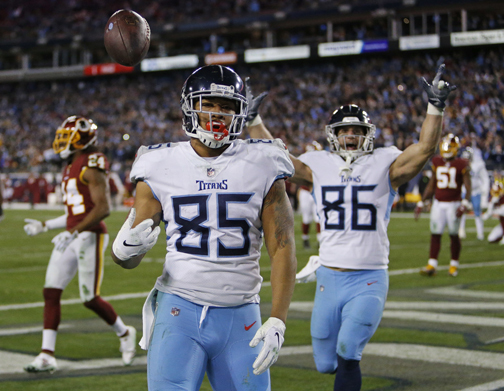 With the Titans on the ropes against the Washington Redskins in the fourth quarter last Saturday, it was a touchdown pass from backup quarterback Blaine Gabbert to tight end MyCole Pruitt that put Tennessee ahead to stay and makes Week 17 meaningful for the Titans’ playoff hopes. While you can safely assume that Gabbert and Pruitt aren’t on anyone’s fantasy team, it seems fitting that such an unheralded duo stepped forward to save, at least temporarily, the Titans chances of playing in the postseason. Role players and backups have had to step up all year long to keep this team afloat. Gabbert is a former first-round pick of the Jacksonville Jaguars whose name usually is mentioned fairly early in the conversation when quarterback busts are discussed. But in relief of an injured Marcus Mariota on Saturday, Gabbert enjoyed perhaps the finest hour of his checkered career, completing 7 of 11 throws for 101 yards and the game-winning touchdown. Gabbert says the mindset of rising to the occasion when called upon comes from coach Mike Vrabel. “We’re just gritty, tough, you know, and it starts top down,” he says. “Guys will put it all on the line for Coach Vrabel, and I’m just so thankful to be here and play for a guy like that who’s been there, done that and instills the right things in this team. As for Pruitt, he wasn’t even a Titan until the second week of the regular season. He was signed off the Texans’ practice squad after the devastating ankle injury that sidelined Pro Bowl tight end Delanie Walker in the season opener. Walker’s injury set the tone for the Titans being without many of their top stars at various times this season. “There’s been a lot of injuries on this team, but the next guy has stepped in and done what he’s needed to do,” Pruitt says. Mariota has missed one game and been knocked out of three others this year, including Saturday with the recurring elbow/stinger issue he has dealt with. The Titans had to revamp their offensive line this season with Jack Conklin unable to find his groove after coming off ACL surgery. Dennis Kelly has stepped in and re-solidified that spot, and at various times this season the Titans have also had to call upon the likes of Tyler Marz and Corey Levin to fill in on the offensive front. But to hear left tackle Taylor Lewan tell it, just because someone is missing is no excuse for shoddy play. The problem also has plagued the defense. Outside linebacker Brian Orakpo has missed the past two games with an elbow injury, and the Titans were without one of his top backups in rookie Sharif Finch on Sunday. In the secondary, the Titans lost Logan Ryan for the season last week with a broken fibula, but third-year pro LeShaun Sims, who has proven to be a reliable backup at corner, filled in capably. “We’re a unit, and the thing about a unit is that when someone goes down the strength of the unit doesn’t drop,” Ryan says. “I was extremely confident in LeShaun, and I knew that guys like Malcolm (Butler), Adoree’ (Jackson), KB (Kevin Byard) and Kenny (Vaccaro) would all step up and maybe do a little bit more than was asked of them in my absence, and everyone did that. The path to the playoffs may have gotten a lot tougher for the Titans in the aftermath of Week 16. Not only Mariota was injured again, Pro Bowl defensive end Jurrell Casey might miss time with what appeared to be a serious knee injury in the fourth quarter. If Casey and/or Mariota are out, the next-man-up mantra might be pushed to the limit with the playoffs on the line Sunday. Veteran linebacker Wesley Woodyard, who missed two games earlier this season, says everyone on the roster knows they must contribute when someone goes down, and they have to be ready for the inevitable.